The Whitworth Hawaiian Club, Na Pu'uwai o Hawai'i (The Heart of Hawai'i), will share food and culture with the Whitworth and Spokane communities during the club's 42nd annual Lu'au on Saturday, April 14. This year's theme is "Do the Hula." Roughly 40 Whitworth students will dance in several Hawaiian and Polynesian dances. The menu will include kalua pig, lomi salmon with diced tomatoes and onion, macaroni salad, pineapple, rice, and haupia, a coconut dessert. The annual Hawaiian Club Lu'au draws about 700 Whitworth students, parents, alumni, administrators and Spokane community members. 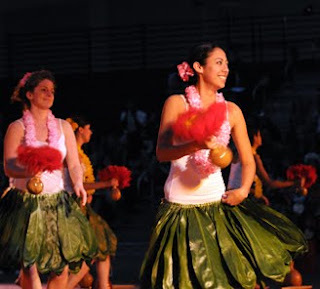 Sarah Sagarang, president of Whitworth's Hawaiian Club, encourages members of the Whitworth and Spokane communities to experience the Hawaiian-style food and entertainment, as well as to support the hard work of the students participating. "One thing that will make this Lu'au unique is that about half of the songs we are performing this year are in English," Sagarang says. "The dancers find them really fun and we are hoping the audience will, too." The dancing this year will include several kinds of hula, including a traditional Kahiko; Tahitian-style dance; the famous men's haka, a warrior intimidation dance from New Zealand Maori; a faculty dance; and a finale. A portion of the dances will be accompanied by Hawaiian instruments, including the uli uli, a red-feathered gourd that is shaken like a rattle; the pu'ili, comprised of split bamboo that is tapped together to make a sound; and the ipu, a hollowed-out gourd tapped with the hand to make a light percussive sound. The entertainment portion of the program will feature a Hawaiian singer, a raffle giveaway, and a country store selling Hawaiian goods. When: Saturday, April 14. Doors open and dinner begins at 5:30 p.m.; entertainment begins at 7 p.m.
Tickets: $20 general admission; $15 for children ages 12 and under and seniors 65 and over; $10 for students with I.D. To purchase tickets: Tickets will be available for purchase beginning Monday, April 2 at the information desk in the Hixson Union Building (HUB) at Whitworth University. The desk is open Sunday-Thursday, 8 a.m.-1 a.m., and Friday-Saturday, 8 a.m.-12 a.m. The Hawaiian Club also will be selling tickets at a table in the HUB April 2-6 and April 9-13 during lunch (11:30 a.m.-1 p.m.) and dinner (5-6:30 p.m.). Tickets are sold on a first-come, first-served basis. For ticket information, call the information desk at (509) 777-3796. Sarah Sagarang, Hawaiian Club president, Whitworth University, ssagarang13@whitworth.edu.